Universal Orlando transforms itself into a murderous, terrifying gothic wonderland every fall. This year is the 25th anniversary of Halloween Horror Nights, and it’s filled with iconic scenes from horror history that make the guests victims in their personal horror movies. Here’s how they build their elaborate horror houses. It’s been about a year since I first experienced Halloween Horror Nights, and it’s really stuck with me. A big part of the experience is the jump scares and the creepy ambience. But what makes these “scare houses” so interesting to me is the way they offer another way for fans to interact with and experience their favorite horror movies and moments. Going through last year’s Halloween ‘78 house was a visceral, claustrophobic experience that really did feel as though I was in a horror movie. I was excited to see what movies they’d be recreating this year, and to get a better look at how they develop and build each scene, we got our hands on some early concept art as well as photos of the insides of the houses. I talked with Halloween Horror Nights Creative Director Michael Aiello about the process of bringing iconic scenes to life. io9: Let’s start with the Freddy vs. Jason house. You’ve got one house with two enormous personalities. How do you balance both characters inhabiting the same area? How do they interact with each other? 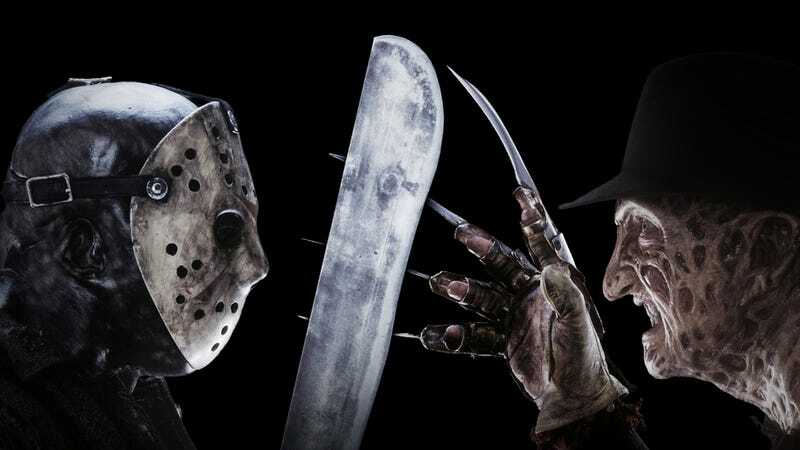 Michael Aiello: That is certainly the challenge with handling two icons of the horror/slasher genre. How do you give them both their due? Most horror lovers undeniably pick one over the other – you have your die-hard Jason fans and your die-hard Freddy fans. In creating the maze, we wanted to make sure that regardless of where your allegiance falls you’re going to be satisfied. The maze effectively gives you tastes of both. You’re going to find yourself within Camp Crystal Lake, walking through cabins, being attacked by Jason. You’re going to enter the dream realm and find yourself facing the iconic 1428 Elm Street house. Freddy is going to stalk within his boiler room. Then the focus of their attention is going to shift to each other as you find yourself in the middle of the battle within a dream realm environment that blends their worlds together. Is there a specific scene from the movie that’s your personal favorite in this house? Aiello: Seeing a replica of the Elm Street house is by far my most favorite moment. Some houses seem more suited for jump scares while others have more of a creepy, foreboding atmosphere. What are some of the steps you take to establish the mood of a house? Aiello: It all goes back to the tone and story we are trying to tell and the different ways we can engage the guest walking through. A paranormal based attraction is going need to live in a vastly different creative realm than a slaughter house environment. Audio is so important to any maze. It really does set the subliminal tone of an attraction. Something paranormal is often times relying on a quieter mood… more ghostly atmospheric textures. A slaughterhouse is going to probably rely on chainsaws and chaotic textures. We also employ smells to transport our guests into the environments. We want to affect all the senses even before the scare. How do you approach creating a house that has a humor theme built into it, like anything involving Jack? Aiello: I have always found humor and horror live closer than you think– even though they’re at opposite ends of the spectrum as far as the genres are concerned. When someone is scared while watching a film or at our event, nine times out of ten that scream is instantly followed by laughter. The use of humor in a Horror Nights maze is placed extremely carefully to allow the guest to let their guard down just enough before another scare is about to happen. Theme can also play into it as well! In the past, we’ve done mazes that place a horrific spin on national holidays like Christmas, Thanksgiving, and even Arbor Day. It becomes effective applying the spin to it to bring a comedic tone while surrounding the guest in kitschy horror. We have even created a cheesy late night horror host by the name of H.R Bludengutz to MC a maze before. Speaking of Jack, what can you tell me about his return this year? Aiello: Jack the Clown was our first and most popular “icon” for Halloween Horror Nights. He’s re-emerged several times since his first appearance in 2000 to play as host to HHN. For our 25th year, there was no other character that could better represent HHN’s past and present than our evil clown. He is our host, our ringmaster of sorts, and the entity that has brought our diverse collections of horror together from known brands like The Walking Dead and Freddy vs Jason to original characters and themes from the event’s 25 year history. Jack is Halloween Horror Nights!